ClarionSafety.com's website was selected by GDUSA as a winner for the website design category for ecommerce. We’re honored to receive this recognition for our website. GDUSA received 10,000 submissions and only chose the top 10% – an accomplishment that our team at Clarion Safety is very proud of. 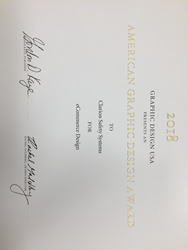 Clarion Safety Systems, a leading designer and manufacturer of safety signs, safety labels and safety tags, was recently recognized by Graphic Design USA (GDUSA) as an American Graphic Design Award winner for 2018. Clarion Safety received GDUSA’s award in the website design category for ecommerce. This fall, the company redesigned and launched a new and improved website at http://www.clarionsafety.com, with an aim to aid product manufacturers and workplace safety professionals in finding the products they need to meet safety and compliance objectives. With the launch, Clarion Safety gave the site a new look and feel and redesigned the shopping experience. “We’re honored to receive this recognition for our website. GDUSA received 10,000 submissions and only chose the top 10% – an accomplishment that our team is very proud of,” says Ron Crawford, CEO of Clarion Safety Systems. New, lighter look and feel: the overall look and feel of the site was completely refreshed. The homepage, as well as the style and content of pages throughout the site, were overhauled with user experience and feedback in mind, as well as taking a personalized approach to safety. Easy-to-navigate design: a new, simplified main menu navigation was implemented to allow for the quick location of products and information. Improvements were also made to enhance online search functionality and fully embrace mobile optimization. Improved shopping experience: a number of updates were made to Clarion Safety’s online catalog to allow for easier selection and ordering of safety labels, signs and tags. This included more intuitive product categories, simplified at-a-glance product specifications, and a more streamlined ordering process with easy ‘add to cart’ functionality and updated technology for improved speed. Earlier this month, Clarion Safety released another new feature to its site, launching a Custom Product Designer – an online tool that allows for safety label, sign and tag customization in three easy steps. To learn more, viewers can browse ClarionSafety.com, shop for safety products, register for an online account or sign-up to receive Clarion’s safety and compliance news. For 55 years, GDUSA has sponsored competitions to spotlight areas of excellence and opportunity for creative professionals. Its American Graphic Design Awards™ is the original and flagship, open to the entire creative community and honoring outstanding work of all kinds and across all media. Roughly 10,000 entries were submitted; a highly selective 10% are recognized. For more information, visit http://gdusa.com.